Oil tank removal- it’s important to ask the right questions. Residential and commercial oil tanks have always been an efficient, cost effective method for heating your home or business. The advantages have been well known for years. Still, there are also numerous cons to owning one, making oil tank removal a smart option. There are many reasons why you may want to remove your oil tank. Perhaps it has become old and unsightly. Maybe you are tired of the excessive maintenance that is required. It could just be environmental concerns. You could be selling your home and you want to make sure that your oil tank is not going to be an issue. The bottom line is you want to remove your oil tank. However, there are some important questions you must ask first. You can get an oil tank for less money than a gas furnace. On the contrary, you will pay more for the actual fuel. With all the political and global upheaval, the price of oil is quite expensive and it rises steadily each year. A leak in your oil tank can be disastrous. That’s why it’s vital to perform periodic checks to ensure the oil tank is working properly. The problem is that your oil tank may not be conveniently located, making upkeep a major nuisance. If you need to replace it, this could involve extensive disturbance to your basement or yard. Let’s face it. An oil tanks is not exactly attractive. It can look unpleasant whether it’s occupying a large space in your basement or a conspicuous spot in your backyard. This can be a particular concern if you are selling your home and trying to attract buyers. In fact, some homeowner’s insurance companies are now refusing to cover homes with underground oil tanks. Oil is not the cleanest type of fuel and there are many concerns about burning oil and its effect on the air we breathe. An oil tank leak can cause significant damage to the surrounding soil and water for not only your home or business but the neighbors as well. In most cases, if you have a problem with a gas furnace, you may be able to troubleshoot the problem yourself. The same is not true for an oil tank. For regular maintenance, installation and repairs, you need to hire a licensed professional to handle this toxic substance. There is also legal documentation and procedures that must be followed when dealing with an oil tank. Can’t I just fill the area with sand and forget about it? While this was once considered a safe way to deal with underground oil tanks, today we know better. Years ago, oil tank failure was rare. Now, with these tanks getting older, it’s becoming more common. Filling the tank with sand can be very costly and time consuming as well, since you have to dig and then refill the hole. Is it possible to receive assistance in paying for oil tank removal? There are grants available to help with the cost of oil tank removal. The Environmental Protection Agency has a program to assist with this task as well. There are grants you can apply for online. Your insurance may cover some of the cost for expenses. The cost could range from $5,000 to $10,000 or more. Does oil tank removal take a long time? In most cases, an old oil tank can be removed in one day. A new tank can typically be installed in one day. If you opt for a new oil tank, an above ground model would be your best choice as it you can maintain or repair it with less effort. What happens if a leak is discovered during my oil tank removal? This is reason for alarm. If your oil tank is found to be the source of ground or water contamination, the consequences and liabilities can be enormous. How it is handled will depend on the size of the leak and whether the oil has reached the groundwater. Grants and loans may be available to help cover the cost of oil tank removal and cleanup. If the oil tank is not leaking or causing problems, can’t I just ignore it? Abandoning an old oil tank is simply delaying the inevitable. Of course, there are different kinds of oil tanks, but if it is old, it may be one of the single steel wall types, in which case the question is not if it will leak but when. Corrosion and rust can breach the shell and leak petroleum into the ground. Even if the tank itself is okay, the piping leading from the tank could also be a concern. If you’re not going to use it, it’s best to have it removed before trouble occurs. Waiting will likely cause you to pay extra. The house I want to purchase has an oil tank. What should I do? If you don’t want the oil tank, it might be a smart idea to ask the seller to remove it prior to purchase. In the event that this is not possible, you should factor the oil tank removal into your bid. On the other hand, if the oil tank is the primary source of heat for the home, make sure you have it tested by a qualified, licensed professional prior to closing to ensure it’s in good working order. Also, check to see if the oil company offers insurance on the tank but be sure to carefully read and understand any limitations and exclusions. If they find a leak, the seller will be responsible for the costs or any removal or cleanup. Seek legal advice before making any final decisions. What is the process for oil tank removal? A technician arrives and takes measurements, checks how much oil you have left in the tank and provides a cost estimate for removal. All relevant paperwork must be completed and filed and your town issues a permit. Utility companies will be contacted to ensure lines are well marked to prevent damage and disruption from digging. After they remove the tank, an inspector visits to determine whether any oil leaked. If you receive a green light, then the area will be filled and covered with grass seed or hay. If a leak has occurred, appropriate steps will be taken regarding any cleanup activities or fines. How can I choose the right oil tank removal company? Make sure that the company you choose is reputable and has a long history of success. This is not the type of job for the inexperienced, amateurs or someone working out of his home. The company should have its own equipment, personnel and insurance. It’s also vital to check licensing. 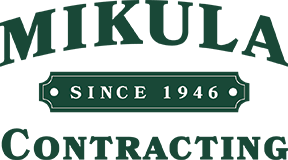 Contact Mikula Contracting today to discuss your oil tank removal!